At long last, the Pug pattern is available to you! You can find it on Ravelry, Etsy, or Lulu. This is an intermediate level pattern. Skills required include a variety of increases and decreases, intarsia, and seaming. The anorak can be knit without seams by working the sleeves in the round. If you notice any mistakes, please let me know, and I'll post the corrections here. I hope you all enjoy the pattern! Now I'll stop hanging around in front of the computer, and go enjoy the sunshine by planting some bulbs. I hope you're all having a lovely weekend! September 20, 2009 at 3:26 p.m. Completely cute! This pug is now at the top of my queue! September 20, 2009 at 4:38 p.m.
on a day like today I wish I knew more about knitting... my daugther would be so thrilled if I ever made her something like this! he is adorable... love the face!! September 21, 2009 at 9:31 a.m.
What a mug on that pug! He has that first day of school smile. I know just who to knit this for. My neighbor's boy started kindergarten this month. Thanks you for the inspiration. September 21, 2009 at 11:42 a.m.
Do you ever sell finished products? I am very very new to knitting and could never get that done. 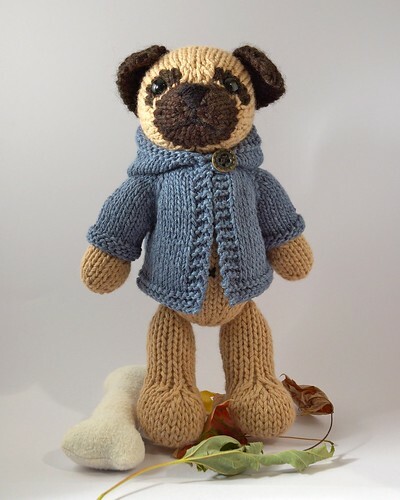 We are doing hand-made or personal items for Christmas this year and my sister LOVES pugs. Thanks! November 12, 2009 at 11:47 a.m.